To give you some context, we are a 50+ person woman-owned private company with 3 offices across the globe: Chicago, USA – Our Headquarters; Montevideo, Uruguay; and Cuenca, Ecuador. We are a distributed agile company by design, meaning we run our business from Sales to Engineering using agile. On the Engineering side of the company, we are currently around 35 people between Developers, Testers, Designers, etc. The combination of these positions is what we consider a Dev Team. A Dev Team is then assigned to work on a particular project for a client. When the project is completed, the Support Team takes over to make sure our client’s systems keep working as expected. Our value proposition is to build custom software in a Smarter/Faster way. It has been working very well for us. We have been growing the past few years, and our goal is to double the engineering headcount by the end of 2019. As a VP of Engineering, this is a very interesting problem to solve and to plan for it ahead of time. You need to start putting in place the right foundation that will allow you to scale/grow without overextending yourself or the company in the process. The order is not related to the importance, but in this post, I wanted to focus on the Career Ladder, I will talk about the other ones in future posts. Our company’s DNA is closer to a Start-Up so when we started thinking about the need of a Career Ladder, it was a little bit scary because the name itself implies a structure or hierarchies which we have always tried to avoid. People were often asking us “what is next?” and we did not have a clear answer for them or even worse, we could not easily tell if a person was ready for the next step (not to mention we did not even have formalized titles, etc.). So as you can see any promotion or salary increase did not follow an unbiased process. When we needed to hire, it was hard to know which position or level of the position to hire for. Responsibilities and expectation of a position were assumed or understood differently since there was not a formal description. Salary range and increases were always a problem since we did not have levels tied to the positions. Turnover, luckily this did not hit us hard, although we did lose people due to a lack of a defined growth path. 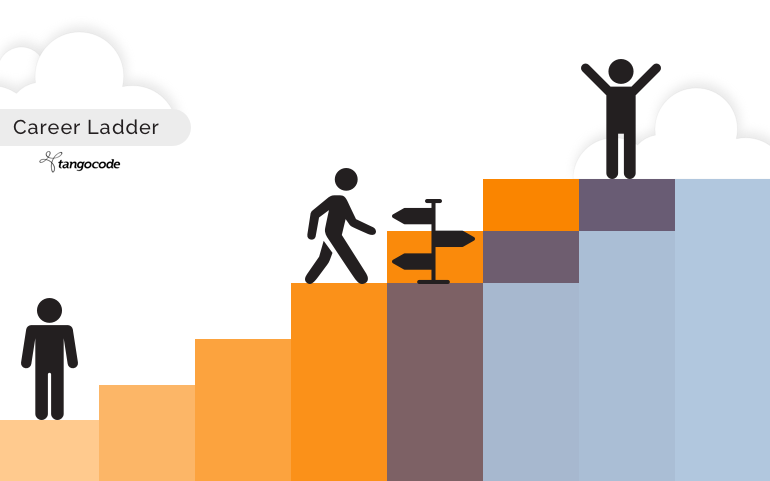 The process we used to implement the Career Ladder. Technical Skills: What toolset is needed to perform your job correctly. Efficiency & Productivity: How proficient are at what you do. Business Impact: What is your added value (“the extra mile”) to your team, division and ultimately the company. Communication & Leadership: What is the level of reach you have across the rest of the company. How many levels should a position have? How many years of experience is typically needed at each level? Does the position have a “Technical Track” and a “Management Track”? In this step, you should surround yourself with domain experts in each of the positions to get feedback. 4. Assign: This is the toughest step because here is where you start giving position titles to your current employees. You have to make sure you put in the time to get this part right. Our Executive Team was heavily involved in this, and we had to make tough decisions to make sure we were aligned with our overall company strategy. 5. Roll Out: This is the most important part of the process. We first announced it in our monthly All Hands meeting. Next, we met with every single person in the Engineering department and explained to them the career ladder for his/her position, justified the difference between levels, and why they are at a specific level etc. Be prepared to have difficult conversations, some people may feel that they should be at a higher level. You need to be able to explain in a very transparent and honest way why each person has been placed at a specific level. 6. Feedback & Improvement: This is the step we are at now, and we have noticed very positive comments and feedback that this process was needed. We will keep monitoring this to continuously improve it. What we gained from the Career Ladder. Our regular one-on-one meetings are more productive: People are coming to the meetings prepared to talk about specific things they need to work on to advance in their career, in addition to if they need anything from the company to help them get there. People conducting the one-on-ones can also now provide better feedback based on what is expected of that position. Accountability: People now know what is expected from their current position and what they should be responsible for. There are no assumptions anymore. Overall the whole journey was positive, and I think we made the right decision. Nothing is perfect, but you need to start somewhere and refine it from there. If you want to check out what our Career Ladder looks like, Click Here. We are always hiring so check out our website for available positions.